NEW YORK, Nov. 2, 2017 /PRNewswire/ -- iStar (NYSE: STAR) today reported results for the quarter ended September 30, 2017. The Company has also published a supplemental to this earnings release which is available at www.istar.com in the "Investors" section. Net income (loss) and adjusted income (loss) for the third quarter were $(0.48) and $(0.05), respectively, per diluted common share. Executed a comprehensive series of capital market transactions totaling $2.0 billion. Upgraded by all three major rating agencies. iStar reported net income (loss) allocable to common shareholders for the third quarter of $(34.5) million, or $(0.48) per diluted common share, versus $46.3 million, or $0.44 per diluted common share for the third quarter 2016. Adjusted income (loss) allocable to common shareholders for the third quarter was $(3.6) million, or $(0.05) per diluted common share, versus $49.1 million, or $0.47 per diluted common share for the third quarter 2016. For the nine months ended September 30, 2017, net income allocable to common shareholders was $115.8 million, or $1.61 per diluted common share, which compares favorably to $63.2 million, or $0.66 per diluted common share for the same period in 2016. Adjusted income was $183.1 million, or $2.16 per diluted common share for the nine months ended September 30, 2017, growing from $109.9 million, or $1.06 per diluted common share for the same period in 2016. During the quarter, all three major rating agencies upgraded iStar's corporate credit rating and the majority of its outstanding preferred and debt securities. This marks the first upgrade of iStar's corporate rating from S&P in over six years and the first upgrade in corporate rating from Moody's in nearly five years. "We were very pleased to see the rating agencies recognize the significant progress iStar has made in improving our overall credit profile by strengthening liquidity, de-levering our balance sheet, extending our maturity profile and monetizing our legacy assets," said Jay Sugarman, iStar's Chairman and Chief Executive Officer. "The improved ratings will reduce our marginal cost of capital and should allow us to be more competitive in pursuing a wider set of investment opportunities." As previously reported, iStar executed a comprehensive series of capital markets transactions during the third quarter which enhanced the Company's overall financial position. Repriced, extended, and downsized its $473 million L+375 secured term loan due July 2020 to a $400 million L+300 secured term loan due October 2021. Issued $250 million of 3.125% convertible notes due September 2022. Subsequent to the end of the quarter, the underwriters exercised their overallotment option to purchase an additional $37.5 million of convertible notes bringing the entire series up to $287.5 million. The notes are convertible at the option of the holders at a conversion price of approximately $15.54 per share, subject to adjustment. Repurchased 4.0 million shares of its common stock for $46 million, or $11.51 per share. Upsized and extended its revolving credit facility to $325 million from $250 million, including an additional commitment of $50 million from Barclays and a new $25 million commitment from Morgan Stanley. Redeemed the $550 million outstanding of its 4.0% unsecured senior notes due November 2017 at par. Redeemed the $300 million outstanding of its 7.125% unsecured senior notes due February 2018 at par plus a make-whole payment. Redeemed the $300 million outstanding of its 4.875% unsecured senior notes due July 2018 at par plus a make-whole payment. Redeemed the $140 million outstanding of its 7.875% series E preferred stock at par. Redeemed the $100 million outstanding of its 7.8% series F preferred stock at par. The Company will record approximately $25 million of charges for the full year 2017 in connection with the foregoing transactions. This includes $16 million of deemed preferred dividends in the third quarter, representing the amount of liquidation preference that was recorded as a premium above book value on the redemption of preferred stock. In addition, the Company expects to record $9 million of make-whole payments on the early redemption of unsecured senior notes in the fourth quarter. Capital structure, leverage, liquidity and other balance sheet metrics in this supplemental are presented as of September 30, 2017 on an actual basis and pro forma for the effects of the capital markets transactions that occurred subsequent to quarter end. Specifically, this activity includes (i) the net use of $1.4 billion of cash for the redemption of $1.15 billion of unsecured senior notes and payment of associated interest expense and make-whole amounts; and, the redemption of $240 million of preferred stock and payment of associated dividends and (ii) the issuance of $37.5 million of additional convertible notes pursuant to the exercise of the underwriters' overallotment option. (2) $240 million of called preferred stock was transferred to accounts payable as of September 30 and is not shown. The Company's weighted average cost of debt for the third quarter was 5.3%. The Company's leverage was 1.8x on an actual basis at the end of the quarter and 2.0x on a pro forma basis, which are at the low end of the Company's targeted range of 2.0x - 2.5x. The chart below shows the calculation of the Company's leverage. The Company continues to maintain a healthy liquidity position. Unrestricted cash and capacity on its revolving credit facility pro forma for the redemption of unsecured notes and preferred stock subsequent to the end of the quarter was $856 million, which is available for new investment activity and working capital. At September 30, 2017, the Company's portfolio totaled $4.6 billion, which is gross of $371 million of accumulated depreciation and $15 million of general loan loss reserves and includes $117 million market value of SAFE shares as of September 30, 2017.
iStar's strategy is to focus on finding investment opportunities within its real estate finance, net lease, and ground lease businesses. In addition, the Company continues to make progress in harvesting value and monetizing its operating properties and land & development assets. 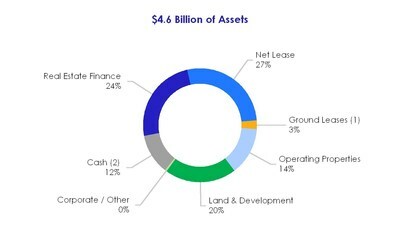 During the third quarter of 2017, the Company invested a total of $140 million associated with new investments (including in additional shares of common stock of SAFE), prior financing commitments and ongoing development across its four segments, and generated $247 million of proceeds from repayments and sales. At September 30, 2017, the Company's real estate finance portfolio totaled $1.1 billion. The portfolio is categorized into iStar 3.0 loans, made post January 1, 2008, and legacy loans, which were all made prior to December 31, 2007. At the end of the quarter, iStar's net lease portfolio totaled $1.4 billion, gross of $306 million of accumulated depreciation. The portfolio was comprised of $1.2 billion of wholly-owned assets, a $110 million equity investment in its net lease joint venture and $117 million market value in shares of SAFE. Since 2014, the Company has invested in new net lease investments primarily through its net lease joint venture with a sovereign wealth fund, in which it holds a 52% interest. At the end of the quarter, the venture's balance sheet, gross of $43 million of accumulated depreciation, included $663 million of assets, $385 million of liabilities and $212 million of equity (net of a $23 million non-controlling interest). The Company entered into an agreement to extend its largest net lease asset with a gross book value of $222 million through 2032, adding 8 years of duration. During the quarter, the Company received net proceeds of $42 million related to net lease asset sales and recognized $18.8 million of gains. The Company seeks to continue to grow its net lease portfolio, but will selectively sell net lease assets opportunistically. At the end of the quarter, iStar's operating property portfolio totaled $624 million, gross of $57 million of accumulated depreciation, and was comprised of $558 million of commercial and $66 million of residential real estate properties. The Company's commercial operating properties represent a diverse pool of assets across a broad range of geographies and collateral types including office, retail and hotel properties. These properties generated $29.6 million of revenue offset by $21.6 million of operating expenses during the quarter. iStar generally seeks to reposition transitional assets with the objective of maximizing their values through the infusion of capital and intensive asset management efforts. The Company made additional progress towards that objective during the third quarter, as it transitioned $57 million of transitional assets into stabilized, bringing the stabilized balance to $401 million at the end of the third quarter. Transitional assets decreased to $157 million. At the end of the quarter, the $66 million residential operating portfolio was comprised of 32 units generally located within luxury projects in major U.S. cities. The Company sold 4 units during the quarter, generating $3.9 million of proceeds and a $0.5 million gain. At the end of the quarter, the Company's land & development portfolio totaled $933 million, including 8 master planned communities, 6 waterfront projects and 15 urban/infill developments. These projects are collectively entitled for approximately 13,000 lots and units. For the quarter, the Company's land and development portfolio generated $26.0 million of revenues, offset by $27.5 million of cost of sales. In addition, the Company earned $0.9 million of earnings from land development equity method investments. During the quarter, the Company invested $34.5 million in its land portfolio. Safety, Income & Growth Inc. is the first and only publicly traded REIT to focus on ground leases. iStar is the largest shareholder and manager of SAFE with approximately 6.3 million shares, or 34.6% of the shares outstanding. During the quarter, the Company purchased 1.3 million shares of SAFE common stock for $24.5 million. During the quarter, iStar and SAFE jointly provided capital in the form of a leasehold financing and ground lease origination on LifeHope Medical Campus in Alpharetta, GA. iStar provided a $24.0 million leasehold mortgage while SAFE simultaneously closed on a $16.0 million ground lease. All joint transactions must be approved by the independent members of iStar and SAFE's Boards of Directors. The $2.0 billion of comprehensive capital market transactions described in this release will result in a one-time pre-payment penalty of approximately $9 million, or $0.10 per diluted common share, in the fourth quarter and $16 million, or $0.19 per diluted common share, of premium over book value on the redemption of preferred stock in the third quarter. Going forward, the transaction is expected to decrease expenses underlying earnings by $0.43 per diluted common share. Asset sales are a material part of the Company's business and have material impact to earnings and earnings guidance. Several asset sales, representing approximately $0.65 per diluted common share of forecasted 2017 income, are now expected to occur in 2018. In addition, the Company will be required under GAAP to recognize an additional $55 million, or $0.64 per diluted common share, gain associated with the second quarter sale of its ground lease business to SAFE. This gain will not initially appear in the Company's 2017 financial results, but will be retrospectively recognized in the Company's 2017 financial results once new accounting standards become effective on January 1, 2018. This guidance assumes, among other things, the closing of certain property sales and that general macro economic conditions continue to remain favorable. Please see the financial tables that follow the text of this press release for a reconciliation from GAAP net income guidance to adjusted income guidance. iStar will hold a quarterly earnings conference call at 10:00 a.m. ET today, November 2, 2017. This conference call will be broadcast live on iStar's website, www.istar.com. To listen to the live call, please go to the website's "Investors" section at least 15 minutes prior to the start of the call to register, download and install any necessary audio software. For those who are not available to listen to the live broadcast, a replay will be available shortly after the call on iStar's website. (1) For the three months ended September 30, 2017 and 2016, includes $2,934 and $1,434 of stock-based compensation expense, respectively. For the nine months ended September 30, 2017 and 2016, includes $12,730 and $7,644 of stock-based compensation expense, respectively. (2) Impairment of assets includes impairments on cost and equity method investments recorded in other income and earnings from equity method investments, respectively. (1) Excludes $2,934 of stock-based compensation expense. (2) Excludes $115.3 million of commitments on loan participations sold that are not the obligation of the Company but are consolidated on the Company's balance sheet.